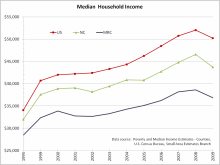 Median household income is defined by the U.S. Census Bureau as being the amount that divides the income distribution of a region into two equal groups; half of the households generate an income over that amount, and the other half with an income below that amount. It is usually perceived as a better indicator of a region’s overall income compared to a calculated average (mean), as it is not dramatically affected by values considered unusually high or low for that region. 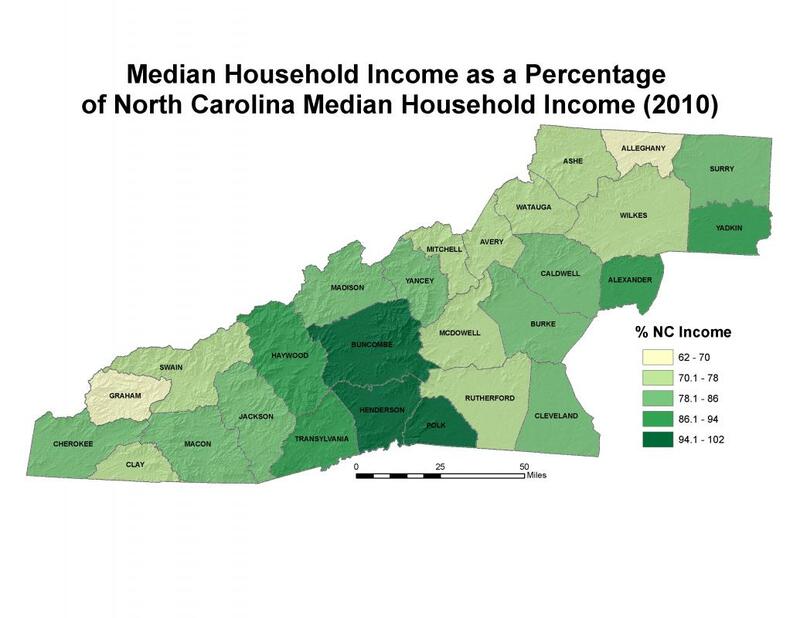 The median household income in the Mountain Resources Commission (MRC) region has not only been consistently less than that of the United States and North Carolina, but has also been growing more slowly since 1995. 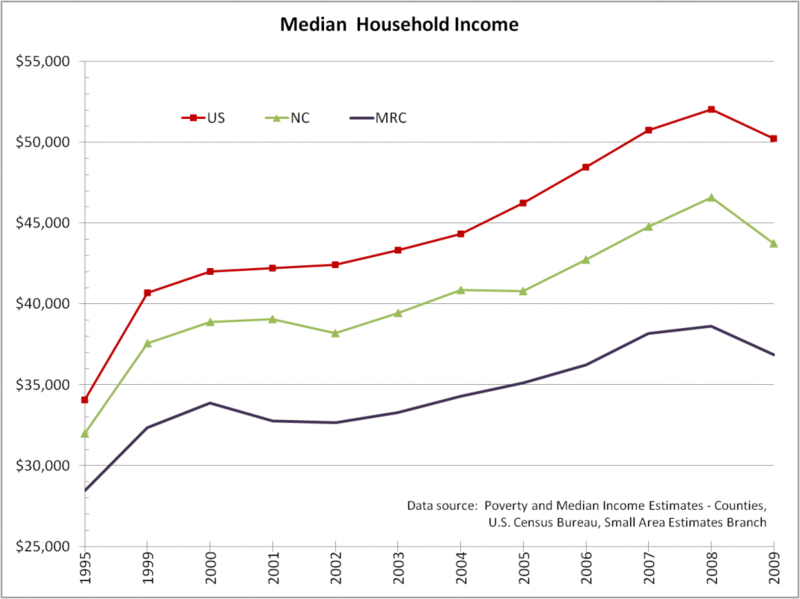 Median household income in the MRC region continues its position below the state and national standards, with the variation enduring a steady increase over the last decade. 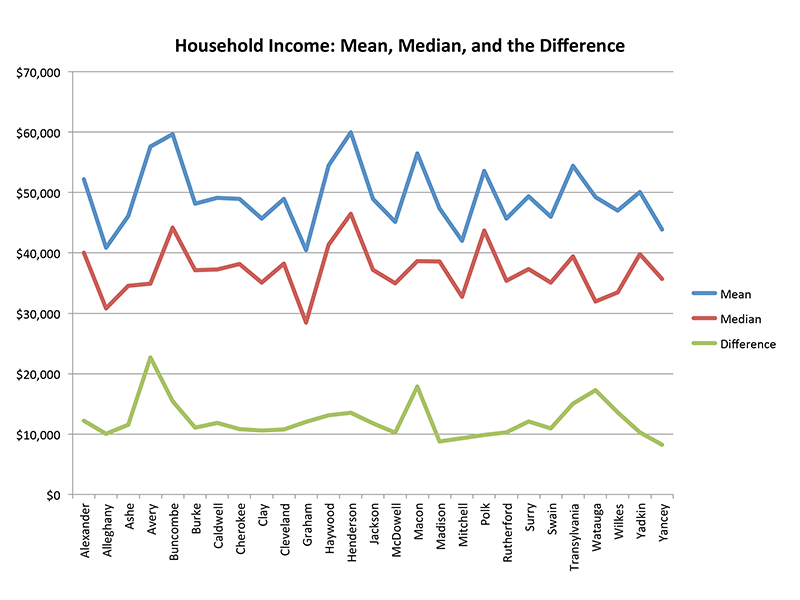 Although the median incomes are at different values, the trends are consistent on national, state, and regional levels, indicating similar responses to broad economic pressures. In 2010, household income in the MRC region ranged from a low of $28,447 in Graham County to a high of $46,446 in Henderson County, and had a region-wide median value of $37,190 – 71.6 percent of the national median household income and 81.6 percent of the state’s median household income. From 1995 to 2010, median household income in the MRC region increased 31.1 percent from the 1995 level of $28,368, while median household income in the state has grown 42.5 percent from $31,987 in 1995 to $45,570 in 2010, and 52.3 percent nationally from $34,076 in 1995 to $50,221 in 2010. Although the median household income has increased in the MRC region since 1995, the percent difference between the lowest and highest median household incomes has also increased, indicating less evenly distributed median incomes among the counties. 1995 saw a 37.1 percent difference between the highest and lowest median incomes, compared to a 48.1 percent difference in 2010. 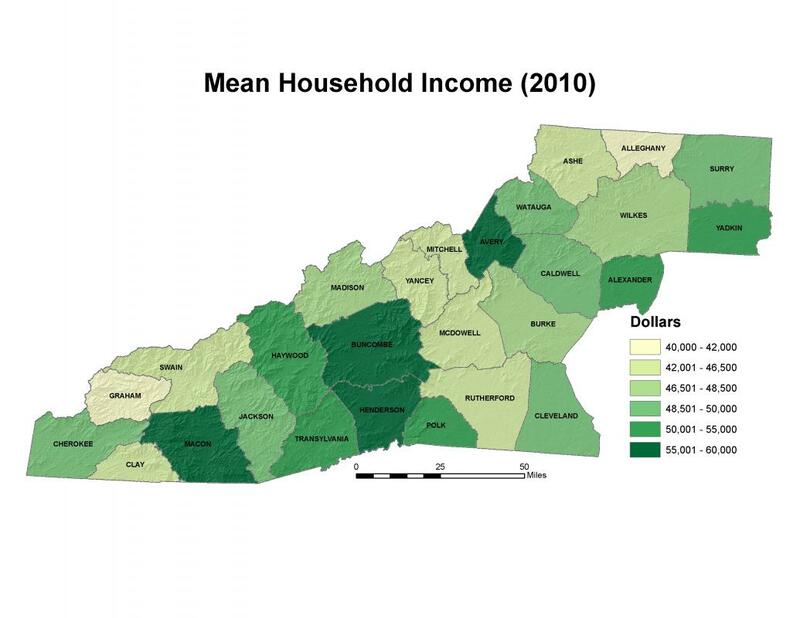 The average (mean) household incomes for the MRC region is also much lower than the state or national averages, with Graham and Henderson Counties having the lowest and highest average incomes at $40,463 and $59,969, respectively, compared to $61,781 for the state and $70,833 nationally. 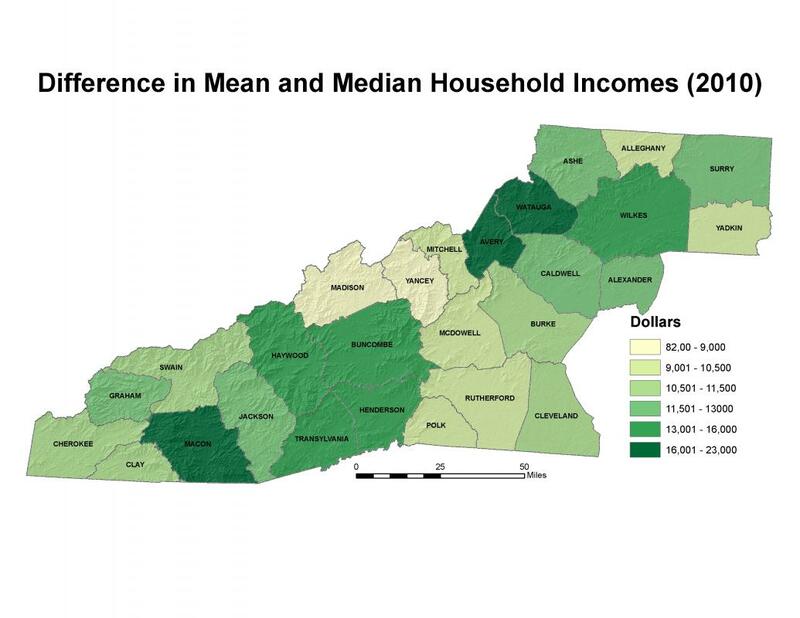 Analyzing the differences between the mean and median incomes can be helpful in identifying counties that have the most economic disparity among households in the region. 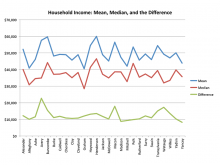 Situations where the median income is lower than the mean can indicate that the minority of higher household incomes has caused the median income value to increase which, when looking solely at the data, can lead to misrepresentations of the economic reality for a majority of households in the county. 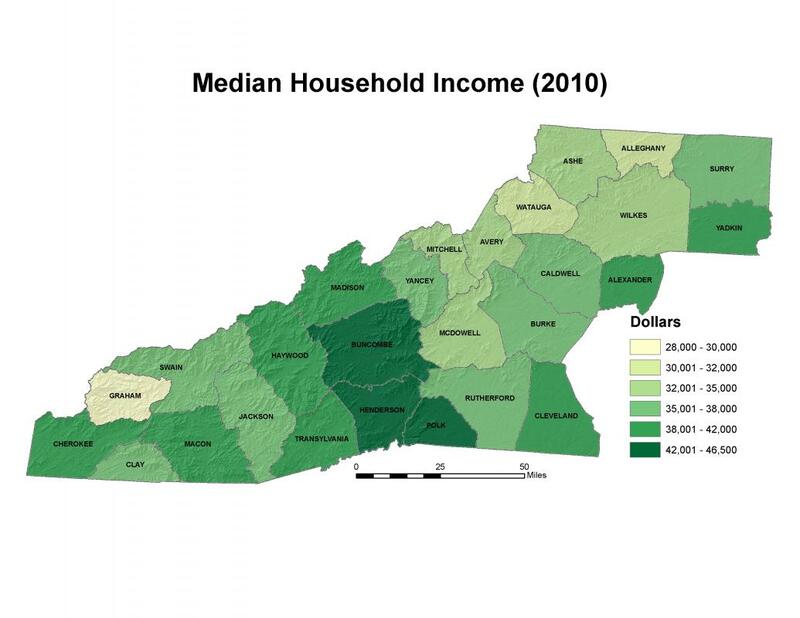 Counties where this difference is greatest, such as in Avery, Watauga, and Macon, should be looked into more closely to determine the possible factors leading to this disparity.